What a lovely and different little snack! Braise 1 small red onion in oil. Add 1 potato cut into small cubes. 1 teaspoon Osmantaj mahal garlic and ginger spice, chili powder, curry powder, and turmeric. Must be a dry filling and add chopped fresh dhania. Let it cool off and set aside. Cut the crusts off of 20 fresh slices of white bread. Wet the sides and end of the bread with water. You can dip a kitchen food brush in a little bit of water and paint the sides and ends. Roll the bread with the filling and seal the edges well. Deep fry in oil until golden brown and drain on paper towel and serve with a tangy dip. 3 tablespoons sweet or garlic chili sauce. Add dried crushed curry leaves. Mix all above ingredients together and whisk well. 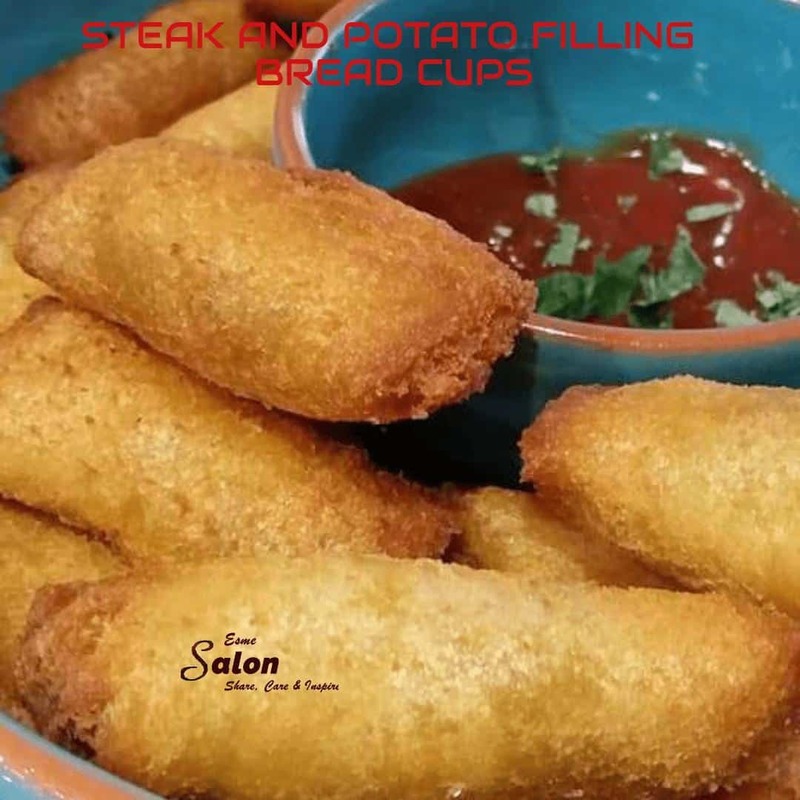 Prepared, tried and tested Feriel Sonday Why not also try this delicious Steak and Potato Filling Bread Cups in your very own kitchen and treat your family and friends! They will come back and ask for more, that you can be sure of. Thank you Rachel – Just a simple little snack for the weekend.